One can't help but feel that, of all the fruits, passionfruit deserves an Australian Craft Beer Hall of Fame spot (were such a thing to exist, of course). It's the defining characteristic of the Galaxy hop at the heart of Stone & Wood's Pacific Ale, which in turn has become the defining characteristic of 1,276 other locally brewed beers (and counting). And, thanks to its natural acidic tang, it's a rather handy tool for anyone playing in the realm of kettle sours or, indeed, just wanting to add a bonus lick of refreshment to a beer without leaning on lactobacillus. Heck, I even recall being told more than a decade ago, on a first visit to The Local Taphouse as a recently arrived Brit raised on English pale ales, 80 shillings and German helles, that Hargreaves Hill's ESB possessed aromas of passionfruit. "Yeah, whatever, mate," I thought as I agreed to sample this piece of nonsense. The barman was correct, of course. "Mind. Blown." So, as the name suggests, here we have a beer featuring that most passionfruity of hops, Galaxy, alongside actual passionfruit within a soured base beer. 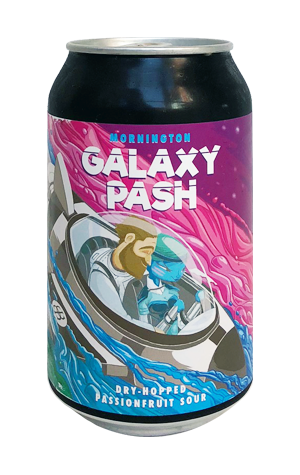 They've got history here, have Mornington, dating back to the much-loved Brain Squeeze, so it's little surprise it delivers on its promise (even if you'll likely need to source something other to secure the cuddle-with-robot-in-a-spaceship of the label artwork). The gently hazy pale gold drop serves up passionfruit aplenty, a touch of sherbet and then some broader citrus aromas too (presumably the work of the hops), and doesn't hold back on the acidic tang either, unlike many fruit sours on the market right now that are more of the former than the latter. That's not all, however. It's just 3.5 percent ABV, thus technically a mid-strength, and as vibrant as any you'll likely come across. Can we order a fresh batch for Golden Plains, please?